Ada & Ina has a collection of over 1 000 linen fabrics and cotton fabrics for curtains, upholstery and clothing. 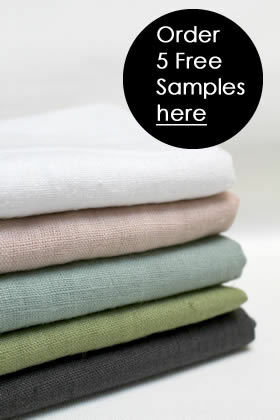 Our fabrics are all 100% natural and therefore perfect as curtain fabric or for roman blinds. You can also use the filter Usage / Upholstery if you are searching for an upholstery fabric! We suggest you spend a while examining our linens online and order some samples to choose a cotton or linen fabric that is the perfect fit for your project. Linen fabric is our specialty and we have linen fabrics in many shades of grey, blue, red, white, green etc. Fabric prices are shown per metre. You can order fabric in 10 cm increments (e.g. 5.3 metres) by editing the quantity in Shopping Cart. Minimum order is 1 metre per fabric.